The Thanksgiving Holiday is almost upon us and in this post I will share with you Thanksgiving Myths Cooking Tips 2016 including how to contact a free emergency turkey cooking line if you need help or have questions. At the end I will even share with you my favorite brine to use on the turkey. A big hit in my family. Thanksgiving is one of my favorite holidays, full of good food and friends. Every year we have quite a big group at my house. We typically cook 2 turkeys. One in the oven and the other Thanksgiving turkey is smoked outside. As I think about thanksgiving, its hard not to think about the Pilgrims. Especially when you live so close to Plimoth Plantation. So I decided to do a little web search on Thanksgiving Myths and see what I could come up that might be worth sharing with you. 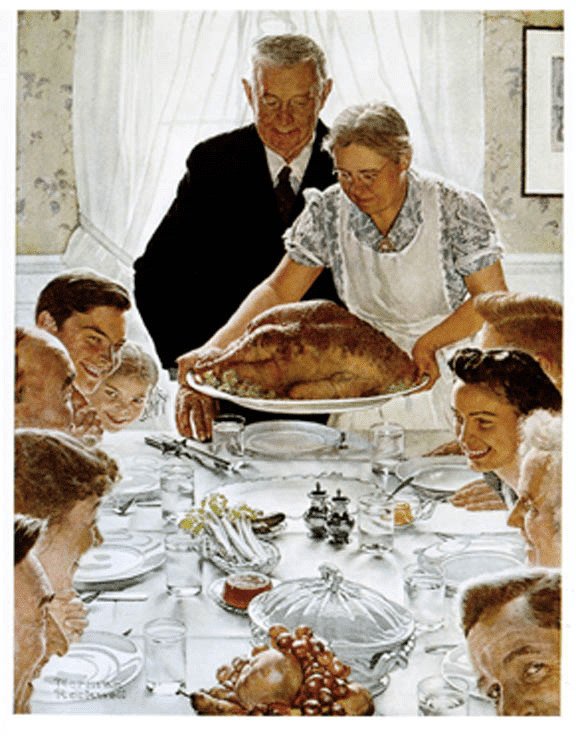 Below is one of my favorite Norman Rockwell Pictures. If you ever come to Massachusetts my home state, the Norman Rockwell Museum is a great take. ?It is located at?9 Glendale Rd / Rte 183 Stockbridge , MA 01262. On the? History News Network, I came across Top 10 Myths About Thanksgiving?written by Rick Shenkman in 2001. The History News Network is a great website and worth checking out. Here are a portion of that article? To see what the first Thanksgiving was like you have to go to: Texas. Texans claim the first Thanksgiving in America actually took place in little San Elizario, a community near El Paso, in 1598 ? twenty-three years before the Pilgrims? festival. Here is a Article that came out in 2013 where they make this claim?San Elizario claims country’s first Thanksgiving. For several years they have staged a reenactment of the event that culminated in the Thanksgiving celebration: the arrival of Spanish explorer Juan de Onate on the banks of the Rio Grande. De Onate is said to have held a big Thanksgiving festival after leading hundreds of settlers on a grueling 350-mile long trek?across the Mexican desert. Then again, you may want to go to Virginia.. At the Berkeley Plantation on the James River they claim the first Thanksgiving in America was held there on December 4th, 1619?.two years before the Pilgrims? festival?.and every year since 1958 they have reenacted the event. In their view it?s not the Mayflower we should remember, it?s the Margaret, the little ship which brought 38 English settlers to the plantation in 1619. The story is that the settlers had been ordered by the London company that sponsored them to commemorate the ship?s arrival with an annual day of Thanksgiving. Hardly anybody outside Virginia has ever heard of this Thanksgiving, but in 1963 President Kennedy officially recognized the plantation?s claim. If by Thanksgiving, you have in mind the Pilgrim festival, forget about it being a family holiday. Put away your Norman Rockwell paintings. Turn off Bing Crosby. Thanksgiving was a multicultural community event. If it had been about family, the Pilgrims never would have invited the Indians to join them. No it wasn?t. Paraphrasing the answer provided above, if Thanksgiving had been about religion, the Pilgrims never would have invited the Indians to join them. Besides, the Pilgrims would never have tolerated festivities at a true religious event. Indeed, what we think of as Thanksgiving was really a harvest festival. Actual ?Thanksgivings? were religious affairs; everybody spent the day praying. Incidentally, these Pilgrim Thanksgivings occurred at different times of the year, not just in November. So how did we get the idea that you have turkey and cranberry and such on Thanksgiving? It was because the Victorians prepared Thanksgiving that way. And they?re the ones who made Thanksgiving a national holiday, While Thanksgiving festivals were informally celebrated throughout the 1600s, they didn’t become an annual event until the 1700s, when each state set aside a different day for the holiday. By 1775, George Washington, then commander-in-chief of the Continental Army, declared the first national celebration of Thanksgiving, and he issued a Thanksgiving Day proclamation in 1789. But the holiday didn’t get a fixed date until 1863, when President?Abraham Lincoln set aside the last Thursday in November for the day of thanks. beginning in 1863, when Abe Lincoln issued his presidential Thanksgiving proclamations?two of them: one to celebrate Thanksgiving in August, a second one in November. According to historian George Willison, who devoted his life to the subject, the story about the rock is all malarkey, a public relations stunt pulled off by townsfolk to attract attention. What Willison found out is that the Plymouth Rock legend rests entirely on the dubious testimony of Thomas Faunce, a ninety-five year old man, who told the story more than a century after the Mayflower landed. Unfortunately, not too many people ever heard how we came by the story of Plymouth Rock. Willison?s book came out at the end of World War II and Americans had more on their minds than Pilgrims then. So we?ve all just gone merrily along repeating the same old story as if it?s true when it?s not. And anyway, the Pilgrims didn?t land in Plymouth first. They first made landfall at Provincetown. Of course, the people of Plymouth stick by their tradition. Tour guides insist that Plymouth Rock is THE rock. No Pilgrim ever lived in a log cabin. The log cabin did not appear in America until late in the seventeenth century, when it was introduced by Germans and Swedes. The very term ?log cabin? cannot be found in print until the 1770s. Log cabins were virtually unknown in England at the time the Pilgrims arrived in America. So what kind of dwellings did the Pilgrims inhabit? As you can see if you visit Plimoth Plantation in Massachusetts, the Pilgrims lived in wood clapboard houses made from sawed lumber. Not only did they not dress in black, they did not wear those funny buckles, weird shoes, or black steeple hats. So how did we get the idea of the buckles? Plimoth Plantation historian James W. Baker explains that in the nineteenth century, when the popular image of the Pilgrims was formed, buckles served as a kind of emblem of quaintness. That?s the reason illustrators gave Santa buckles. Even the blunderbuss, with which Pilgrims are identified, was a symbol of quaintness. The blunderbuss was mainly used to control crowds. It wasn?t a hunting rifle. But it looks out of date and fits the Pilgrim stereotype. It is often stated that President Lincoln’s 1863 clemency to a turkey recorded in an 1865 dispatch by White House reporter Noah Brooks was the origin for the pardoning ceremony. ?Recently White House mythmakers have claimed that President Harry S. Truman began this amusing holiday tradition. However, the Truman Library & Museum disputes the notion that Truman was the first president to pardon the holiday bird. Reports of turkeys as gifts to American presidents can be traced to the 1870s, when Rhode Island poultry dealer Horace Vose began sending well fed birds to the White House. The First Families did not always feast upon Vose’s turkeys, but the yearly offering gained his farm widespread publicity and became a veritable institution at the White House. At Thanksgiving 1913, a turkey-come-lately from Kentucky shared a few minutes of fame with the fine-feathered Rhode Islander. Soon after, in December, Horace Vose died, thus ending an era. The focus on Harry Truman as the originator of the turkey pardon stems from his being the first president to receive a turkey from the poultry and egg board. From September to November 1947, announcements that the government was encouraging “poultryless Thursdays” grabbed national headlines. Homemakers, restaurant owners, and the poultry industry deflated the effort in time for Thanksgiving, but not before poultry growers had sent crates of live chickens? “Hens for Harry”? to the White House in protest. The turkey they presented to President Truman that December promoted the poultry industry and established an annual news niche that endures today. President Richard Nixon sent turkeys to a Washington, D.C., petting farm but didn’t officially pardon them, according to the White House Blog. President George H.W. Bush gave the first official pardon to a turkey in 1989.The formalities of pardoning a turkey gelled by 1989, when George H. W. Bush, with animal rights activists picketing nearby, quipped, “Reprieve,” “keep him going,” or “pardon”: it’s all the same for the turkey, as long as he doesn’t end up on the president’s holiday table. The survivor lived out its days at a Virginia petting zoo called Frying Pan Park. (Sources: LiveScience?-Worth Checking out their site if you love all things science, The White House Historical Association?https://www.whitehousehistory.org/ ) – A absolute favorite of mine). Another family pastime is Thanksgiving football, which has its roots in the Great Depression. After the Portsmouth Spartans moved to Detroit in 1930, the team’s owner knew he had to do something to draw football fans to the new team. In 1934, he arranged a match between the Spartans (renamed the Lions) and the world champions, the Chicago Bears. Though the Spartans lost, a Thanksgiving tradition was born: The game sold out two weeks in advance, and the event became such a hit that it was repeated the year after. This time, the Lions prevailed. At my House, we always wonder how long to cook the turkey. Here is some very useful information on how to Cook a Turkey? But ?timing?s NOT everything.? Recommended cooking techniques must also be followed. A meat thermometer should be used to ensure a sufficient internal temperature has been reached to destroy bacteria and prevent foodborne illness ? as well as to prevent overcooking. A partially frozen bird requires longer cooking. Dark roasting pans cook faster than shiny metals. The depth and size of the pan can reduce heat circulation to all areas of the bird. The use of a foil tent for the entire time can slow cooking. Use of the roasting pan?s lid speeds cooking. An oven cooking bag can accelerate cooking time. A stuffed bird takes longer to cook. Oven may heat food unevenly. Calibration of the oven?s thermostat may be inaccurate. The rack position can have an effect on even cooking and heat circulation. A turkey or its pan may be too large for the oven, thus blocking heat circulation. 1. Set the oven temperature no lower than 325 ?F. Preheating is not necessary. 2. Be sure the turkey is completely thawed. Times are based on fresh or completely thawed frozen birds at a refrigerator temperature of 40 ?F or below. 3. Place turkey breast-side up on a flat wire rack in a shallow roasting pan 2 to 2 1/2 inches deep. Tuck wing tips back under shoulders of bird (called ?akimbo?). Add 1/2 cup water to the bottom of the pan. In the beginning, a tent of aluminum foil may be placed loosely over the breast of the turkey for the first 1 to 1 1/2 hours, then removed for browning. Or, a tent of foil may be placed over the turkey after the turkey has reached the desired golden brown. 4. If a meat thermometer is not available, cook stuffing in a casserole. Mix ingredients just before stuffing a turkey; stuff loosely. Additional time is required for the turkey and stuffing to reach a safe internal temperature (see chart below). 5. For safety and doneness, the internal temperature should be checked with a meat thermometer. The temperature must reach 180 ?F in the thigh of a whole turkey (center of the stuffing should reach 165 ?F) before removing it from the oven. Cook a turkey breast to 170 ?F. 6. Juices should be clear. In the absence of a meat thermometer, pierce an unstuffed turkey with a fork in several places; juices should be clear with no trace of pink. 7. Let the bird stand 20 minutes before removing stuffing and carving. Butterball is the nations largest turkey producer. They have run a hotline for many years. Where you can call and get help. They are very good. In Large Sauce Pan: Over High Heat. Bring the Cider, Brown Sugar and Salt to a Boil. Make sure You stir to dissolve the sugar and Salt. Cook for 1 minute, remove from heat. Allow Mixture to Cool. In 5 Gallon Bucket or Pan. : Combine the water, oranges, ginger, Cloves, Bay Leaves & Garlic. I squeeze the oranges and put skin and all into mix. Then Add what you heated into the sauce pan to this bucket. Prepare Turkey: Remove and discard fat from Turkey Cavity. Submerge Turkey in Brine. Place heavy weight on turkey to make sure its submerged. (24+ Hours in Refrigerator) I do 2-3 days. I also fill up a one Gallon Zip lock bag wth water and use at the weights to hold turkey down. Remove Turkey from Brine: Pat down with Paper Towel till dry. Lightly brush turkey with Vegetable Oil. Then place in oven and cook. I prefer to smoke it. I put it in a pan. I add some water to the pan. Then use Apple, Cherry and very little mesquite to wood. I always use a thermometer to make sure turkey is cooked all the way through.